One very, very hot summer day, a group of hikers slowly realize that the wildlife is acting erratic. They can’t quite put their fingers on the problem, but Radio reports insinuate that the deterioration of Earth’s ozone layer is turning the beasties into killing machines. Sometimes I want to watch a good film. Sometimes I’m a bit tired and not having the energy to be very attentive I just feel like watching something lite and silly. Day of the Animals is a perfect selection for anyone looking for just a goofy time-filler. The characters are well drawn and movie is creepy, suspenseful, and, at times, unintentionally funny. Being a huge animal lover, I really enjoy the eco-thrillers of the 1970s. This is one of the most entertaining movies in the subgenre. 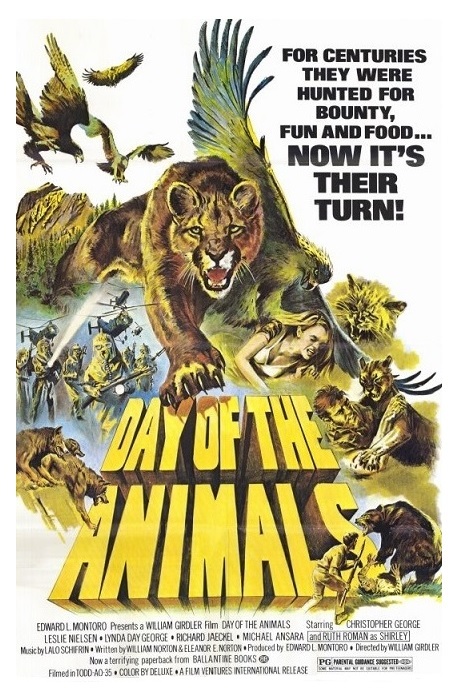 Directed by William Girdler (Grizzly and The Manitou) from a screenplay by William and Eleanor Norton, Day of the Animals is a hokey combination of counterculture anxiety and ’70s disaster craze. I particularly enjoyed the fact that the animals are the heroes of the story and the humans are their usual jackass-selves. You don’t have to pay a whole lot of attention to notice that this is a “global warming movie” before the phrase was coined. Despite the underlying serious social message you never feel like the movie is trying to be anything but a thrill ride. The cast has lots of recognizable faces. I always enjoy seeing real-life couple Christopher George (The Exterminator) and Lynda Day George (Chisum). They weren’t Paul Newman and Joanne Woodward, but they made many fun movies together before Christopher died prematurely in 1983. People only familiar with Leslie Nielsen’s post-Naked Gun career will get a kick out of seeing him as a nasty racist. With Michael Ansara (Broken Arrow), Richard Jaeckel (Sometimes a Great Notion), Ruth Roman (Strangers on a Train), and Andrew Stevens (The Fury). Day of the Animals isn’t an undiscovered gem. Although It often feels like a very poor man’s Alfred Hitchcock’s The Birds, this admittedly silly B-movie is cheez-whiz-fun with a message — kick back and enjoy! Color, 97 minutes, Rated PG.